I taught a wonderful private cooking class in my home kitchen yesterday for a couple that were celebrating the husbands birthday. They are an international couple who love Thai food and we prepared a number of dishes with Thai chicken curry as the entree. I love this recipe as it can be done with a number of variations and is perfect for feeding a crowd. You can substitute pork tenderloin, shrimp, scallops or tofu for the chicken and add any vegetable you like. We added steamed broccoli to the dish for added color. For an easy and satisfying weeknight dish try this Thai curry and enjoy. 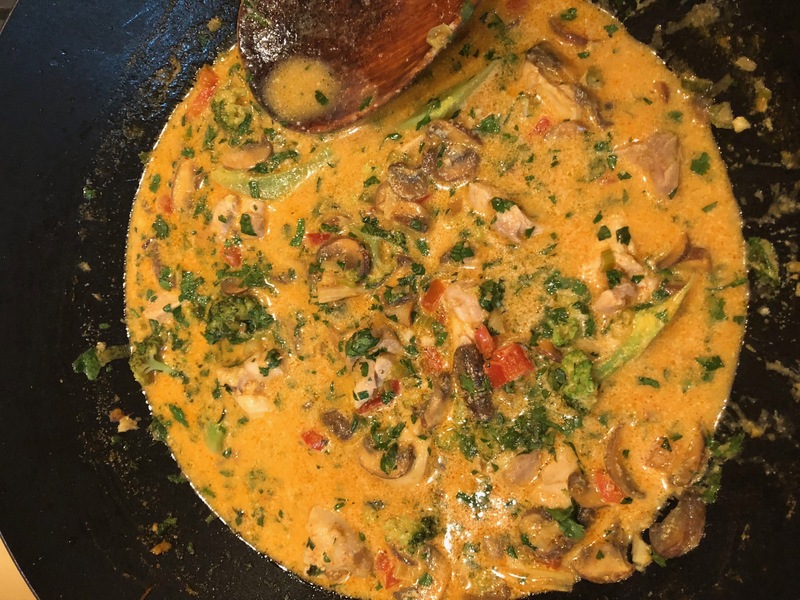 Heat the oil in a wok or large high sided skillet over medium high heat and add the curry paste, stir fry about 2 minutes, then add the ginger, garlic, red pepper, mushrooms and lemongrass. Stir fry for about 3 to 4 minutes. Add the chicken and stir fry for 5 minutes. Add the coconut milk, sugar, fish sauce and lime leaves. Bring to a simmer and cook until slightly thickened about 10 minutes. Taste the sauce and adjust the fish sauce, sugar and lime juice if needed. Remove from the heat and add the cilantro, basil and chilies. Serve over the cooked rice.